Several users have reported this error to me in my Cydia Impactor error guide. So I decided to cover this topic in detail. 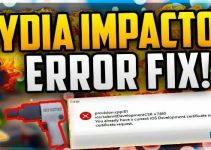 What does cpp 81 Cydia Impactor Error mean? Were you able to fix Fix cpp 81 Error? This error actually means that you have not enrolled in the Apple developer program. Once you enroll in Apple’s developer program, this error will get fixed automatically. However, not everyone wants to purchase a $99 subscription just so they could sign applications using Cydia Impactor. CPP 81 error is also faced by Cydia Extender users along with Cydia Impactor users. This happens because Cydia Extender is just an on-device version of Cydia Impactor. So the error codes and the functionality remain exactly the same. Step 1 Open Cydia Impactor. Step 2 Go to Xcode tab. Step 3 Select the Revoke Certificates option. Step 4 Enter your Apple ID and password. The same method applies to Cydia Extender as well. You simply need to revoke certificates using the in-app options. This method will most likely fix this issue. If provision.cpp:81 error still persists, try using other methods given below. This error may also occur when you enable 2-Factor Authentication security feature. While it’s a great way to keep your account secure, it can lead to errors with unofficial jailbreak applications such as Cydia Impactor and Cydia Extender. Try disabling it and sign your desired IPA file again. Create a new “temporary” Apple ID and input its credentials when Cydia Impactor prompts you to do so. While this might look vague, it does work in many situations. 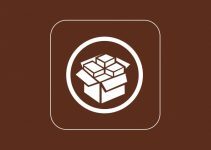 Use the latest version of Cydia Impactor. You can download it below. If you are already running the latest version, try using an older version. Thats’ all there’s to it! Method 1 should fix the cpp 81 error in most cases. 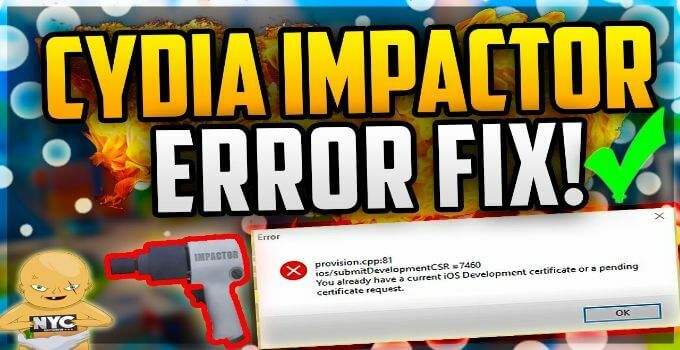 If Cydia Impactor or Cydia Extender tools are still throwing the cpp 81 error, leave a comment below. I will help you fix it as soon as possible. For more such tutorials and guide, subscribe to our social channels. Well @^#%, they made it impossible to turn off 2FA so I am screwed if I ever lose my iPhone. I guess I will stop buying apps on iOS and macOS app store so it doesn’t hurt so much when it inevitably won’t be able to access the account and lose access to all the apps I paid for. Hello, Andressa. Apple is having some server-side issues right now. They are working on a patch at the moment. Im trying to run the latest ios jailbreak for 12.1.2 but ive tried all methods and i still get the error 81 what do i do? Use the second method here. I have tried the first, second, third, and fourth method above and am still getting the same code of 81 =9313. What can I do to fix this? It isn’t working. I got the error “provision.cpp.81 ios/addAppId = 9313” I tried to revoke certifications and it said 1 revoked but same error occurs again. Then i created new account and tried Start it again but still same error “provision.cpp.81 ios/addAppId = 7460″ ,But 9313 changed to 7460. My device is 6s plus and i want to install tsubasa dream team hack from iosgods non jailbroken hacks section. what can i do for that please help me? Which version of Impactor are you using? I’ve tried every method but I still get error 81. Im really confused and ive been trying all the methods over and over again for about an hour. I dont understand whats wrong. I have an iPhone SE its only a year old and I just reset it so its fresh. I know im getting a bit spamming I just wanted to say cancel those two earlier questions of asking for assistance with getting rid of error. I got rid of the error but a new one popped up but this time its with the launcher on my phone. It says red text but its in a Asian language I cannot read or translate. Hi I get a error (No device selected.) (but I have my iPhoneSE plugged in with Apple USB) as soon as I drag the IPA file in to the Cydia Impactor but then I click okay and it goes away and everything is fine. Then I get an error of 81. I looked up how to solve it already but it doesn’t work still, I made a new Apple ID and everything but I still receive an error. Please help . Reset the Apple TV to the factory reset. 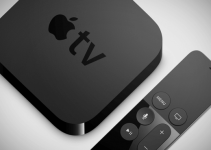 Set up the Apple TV on your screen so that it operates without the jailbreak. Then load the IPA with Impactor. No idea what’s going wrong. Try using another PC or use Extender. I got that error as well, but then I tried the jailbreak and it worked! No mention of my apple dev ID being a problem. Try using another PC and also try it with another IPA file. I get the developer error even with another apple id. 1.) I have removed two-factor authentication. 2.) I have re-logged into the Mac and the iPhone after doing that, because that logged me out of all my devices. At the same time, it also removed the app-specific passwords. 3.) I revoked the certificates via the Xcode menu option. There is only one, each time I do this. I do it before each “Start” button attempt. 4.) I do not want to use another Apple iD, and I am not going to buy a dev account. Am I out of luck, or is there a solution here? I can’t seem to get it working. Are you running only one instance of Impactor? Is your device unlocked? Are date and time set correctly on your PC? Please send a screenshot of the error. I was getting this error for the longest time, and finally i setup a new appleID and all good in the hood. iFile is useless without jailbreak actually. then how to install or jailbreak iphone 7 plus which is currently carried lock and not able to use or go to home screen on iphone . please help i want to jail break my carrier locked iphone. You can’t bypass that lock with a jailbreak. I got the error “provision.cpp.81 ios/addAppId = 9313” I tried to revoke certifications and it said 1 revoked but same error occurs again. I tried to disable 2-factor authentication but I can’t find the app-specific password after I done that and the old password won’t work. Any idea how to solve this? Hello, Hendrix. Have you tried creating a new Apple ID? That might fix the issue. Tried all the above. I get the cpp 81 with 1200 “You are not allowed to perform this operation. Please check with one of your Team Admins, or, if you need further assistance, please contact Apple Developer Program Support”. When i try to revoke my certificates 0 get revoked. I tried it on older versions of Impactor as well. I am trying to add ipa’s to my Apple TV 4. I had 3 installed, then deleted them but know I get this error for any new ipa i want to install, can only install the ones that have already been installed before. Probably because theres still some certificates running around somewhere for them. Im clueless as of what to do. Hello, The Zlatan. Have you tried creating a new Apple ID? Alright. have you tried using the older version of Impactor? I have yes. I’m starting to think that it’s the ipa itself that is corrupt. That could be the case as well. What’s the name of the IPA file? I have the same Problem. It’s the Extender File in the Impactor program. Hello, Manoa. Are you trying to install Extender? Hello, Roger. Use this version of extender – ext3nder. Google it. what if i cant access cydia on my phone? It will not work if you install it that way. Alright. Why can’t you access it? I’ve exhausted all of my options. I’ve done everything listed on this websites and others. Even downloaded the old version of Cydia but i get a brand new errer: “Device Not Found”. I made sure everything was connected properly. I then googled how to fix THAT problem and found nothing. This is frustrating and hope I can find any help on here. Hello, Flareiv. What are you install? I’m trying to install an IPA using Cydia Impactor but I keep getting the “The network Extensions feature is only available to users enrolled in Apple Developer Program” error. I’ve tried everything. Are you able to impact other apps excepting this one? I’m pretty sure it’s the IPA that’s at fault here. Unfortunately, I can’t find any other source for this IPA at this moment. In the meantime, you can try other tweaks like Pyro if you have a jailbroken device. Oh Aight I appreciate the advice fam. Hello, Anke. Have you tried using the older version of Impactor? Hi… my ipad restarted on me and I went to redo the cydia impactor. Getting this error. I’m on the latest version-.9.41 and running on a mac. I get the error when running the cydia extender (its my only option). I have revoked the certs, it says 0 revoked and still gives same error. I have created a new id, same error. 2fa is off and has been off. And as i stated, it installed the latest version of the impactor… Any ideas? thanks for your time! Hello, Joe. Were you able to fix it? Yes Luca, I forgot the iPa! That may be something to add to the guide-make sure you haven’t forgotten any of the normal steps!! It had been awhile since I had to do it. Thanks for the response though! Did you get it working finally, Joe? Hello, Vinny. Which tool are you getting this error on?